A day after the Memorial Day marked by flags and parades, Filipino WW II vets and widows vow to demand a formal public apology from President Barack Obama and the US Congress for 65 years of abandonment, racial discrimination and injustice. ?We deserve full recognition and full compensation. But the wounds of long years of humiliation as second-class American veterans will never completely heal until the US government asks for apology,? says Felino Punsalan, who celebrates 93rd birthday today, without any lump-sum, much less monthly pension, nor any signs that he would be recognized soon as an American veteran. Vets and their families ask California Assemblywoman Fiona Ma to introduce a separate bill demanding for apology. Ma previously sponsored bills supporting HR 210, ?The Filipino Veterans Fairness Act of 2011,? and the inclusion of the Filipino WW vets in the social studies curriculum of schools in California. 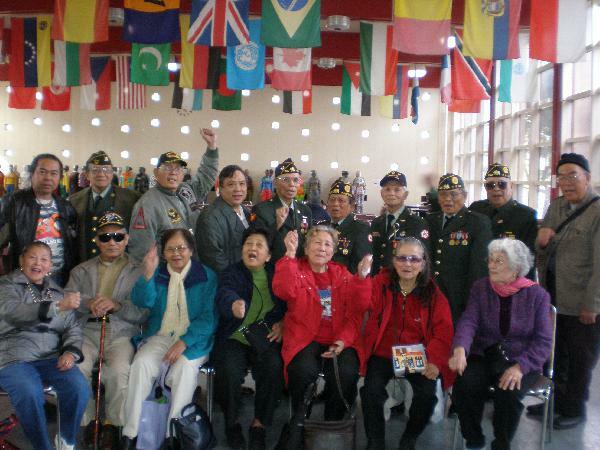 SAN FRANCISCO—A day after the Memorial Day marked by flags and parades, Filipino WW II vets and widows vow to demand a formal public apology from President Barack Obama and the US Congress for 65 years of abandonment, racial discrimination and injustice. “We deserve full recognition and full compensation. But the wounds of long years of humiliation as second-class American veterans will never completely heal until the US government asks for apology,” says Felino Punsalan, who celebrates 93rd birthday today, without any lump-sum, much less monthly pension, nor any signs that he would be recognized soon as an American veteran. Vets and their families ask California Assemblywoman Fiona Ma to introduce a separate bill demanding for apology. Ma previously sponsored bills supporting HR 210, “The Filipino Veterans Fairness Act of 2011,” and the inclusion of the Filipino WW vets in the social studies curriculum of schools in California. Demand for apology comes in the midst of imminent petition to the 11th Circuit Court of Appeals in June, and second Filipino delegation’s visit to the US Congress to lobby for HR 210 in July. Last January, Rep. Jackie Speier, D-CA 12th district San Mateo/San Francisco, introduced a bill that would provide monthly pensions to Filipino WW II veterans and their widows and children equal to other American veterans. During WW II, US President Franklin Roosevelt commissioned 250,000 Filipinos to serve the United Armed Forces in the Far East (USAFFE). They defended the Philippines, an American territory in Asia. In 1946 through the Rescission Act, the US Congress stripped the Filipinos of their US military service and full benefits, out of the 66 allied nationalities that served the US. In the last ten years, the US provided partial benefits to Filipino veterans like health coverage and burial assistance. The Filipino Veterans Compensation Fund (FVEC) provided lump sum to some veterans while denying most widows and some 27,000 applicants. FVEC also came with a waiver to surrender rights for future benefits like monthly pensions that American veterans routinely receive. “Several partial benefits do not in any way constitute full equity,” says Punsalan. During the lobby in the US Congress last April, the staff of Rep. Mike Honda, a Japanese-American internee during WW II, admits that the issue of full equity of Filipino veterans is rooted in racial discrimination.